Return of the Sport Diver! Become a better waterman. Learn how to safely freedive to depths you may have thought were unattainable. After this course you will be FII Level One Certified. 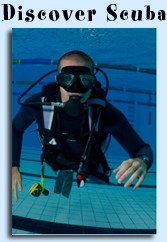 Discover Scuba is a 2-hour experience program where you learn some basic theory and skills. It consists of a 45 minute lecture and 45 minutes of pool diving Learn More HERE . School of Fish Swim and Scuba © 2019. All Rights Reserved.